The recent emergency landing of the Southwest Airlines flight 1380 goes to show the importance of listening to the in-flight safety briefing. The life you save may be your own. However, just telling people to “listen to the briefing,” isn’t going to change behavior. As a frequent flyer myself I understand how repetitive the in-flight bright briefing can be. We’ve all heard it thousands of times and when you hear something that many times after a while you simply don’t hear it. The photos of passengers in Southwest Flight 1380, which made an emergency landing after an engine explosion, quickly spread through the media. Most of them showed that the passengers weren’t wearing their oxygen masks correctly. They are supposed to go over your nose and mouth, not just your mouth. By the way, oxygen is important, just in case you were wondering, so it’s important to know how to get it when you need it. Without oxygen at that altitude, you get hypoxia. The early symptoms can include nausea, headaches, tunnel vision, dizziness, a slight feeling of euphoria, which has fooled many people into thinking they are just fine, when in reality they are on their way to brain damage, which can occur within a few minutes of total oxygen deprivation. Give it a few more minutes and you’ll be dead – but at least you’ll go out feeling good as you head into the light. Read the footnote at the bottom for more information on the oxygen process. We’ve all heard that in an emergency, people either fight, flight or freeze. Freeze is just another term for flight by the way, except that you’re not physically fleeing you’re just sitting there, mentally checked out and useless to everyone including yourself. A brief mental rehearsal can sort of pre-program your brain with a beneficial process to run, if an emergency happens. Many of the articles I’ve seen on this issue since the Southwest emergency have stressed the importance of listening to the pre-flight briefing, but that’s not enough. You need to become an active part of the pre-flight safety process, even if only for a few moments. The way I prepare for every flight is to not just review the safety card, but visualize performing the actions in the card. It doesn’t matter where I’m sitting, but if its an exit row, I make it a point to look at the latch on the door and imagine myself, looking outside to ensure it’s safe, then, visualize opening the door. I also quickly visualize having to open any of the other various doors in the plane. I then determine how many rows it is to the exit ahead of me and behind me. Passengers have died in plane accidents because the cabin filled with smoke and they crawled right past an exit door. I then check under the seat for the flotation device or determine if it’s one of those planes where the seat is the flotation. This entire process is called the mental rehearsal. While I might not remember all of this information 10 seconds later, it is well-established that these mental rehearsals tend to come back to us when we need them the most. That is the whole theory of the BF Skinner operant conditioning style training that pilots, emergency personnel, police officers and the military go through. When the accident happens your brain searches for useful information to keep yourself alive, and if you’ve recently conducted a mental rehearsal your brain tends to access that info. Mental rehearsal just a few seconds of can help your brain make the right decision when the next unexpected situation happens. Footnote: When the masks come down for passengers, they activate oxygen generators which generates enough oxygen to keep you alive but don’t try to do a crossword puzzle at that point. It’s just enough to keep you alive and functional enough to put a mask on a child or assist someone who needs it. The pilots, incidentally, are getting the good stuff. 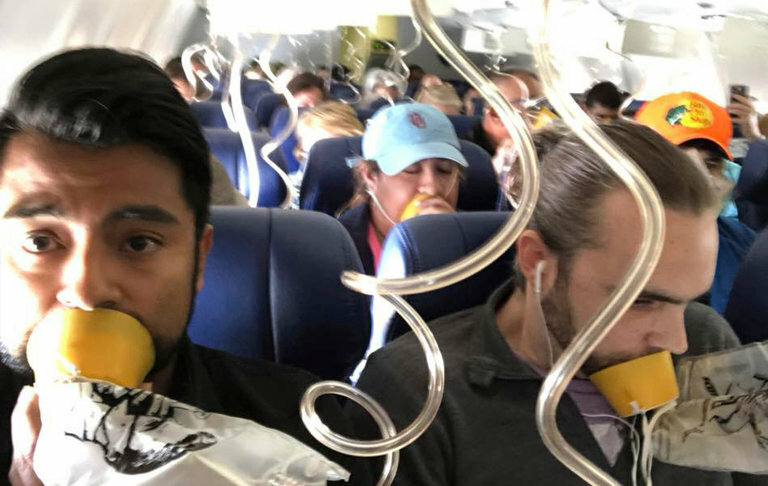 They are getting forced oxygen through their masks because it is sort of a good idea that they be as awake and alert as possible to handle the emergency. Girls! Strike first, strike hard, no mercy sir!